When reading the March 2001 issue of the EEG Newsletter remarks in two articles caught my attention. The first was ‘Who Makes The Crop Circles?’ by Tony Hathway and ‘Some Experiences of Dowsing among the Indigenous People of Canada’ by Henry Dorst. In ‘Some Experiences of Dowsing among the Indigenous People of Canada’ Henry Dorst stated: “After inspecting one medicine wheel in Alberta and finding two (energy) ley lines converging on its centre I assumed that the Native builders of such monuments chose them because they had, somehow dowsed these energies. I was disavowed of this notion after building a brand-new wheel, and again, after helping construct two labyrinths. In all of these cases brand-new, dowsable “water domes” and “ley lines” appeared after people began to use these constructions meditatively. In other words, my assumption that aboriginal North Americans necessarily dowsed – in the way that we understand dowsing – for these energy phenomena before setting up a site for sacred practices, was erroneous”. The presence of underground water and energy lines at ancient sites and sacred places is something widely reported upon by many dowsers and there is no doubt that this is indeed the case. The statements above do not deny this but raise the chicken and egg question as to what came first. This suggests that the answer to the question in hand is two dimensional or in other words ‘black or white’. It is much more complex. The ‘chicken’ could be any one of several hundred breeds; the ‘egg’ could be brown, white or speckled. Therefore we have many thousand computations or dimensions to consider. This is equally true about ancient sites, underground water and earth energies. The question as to what came first is something that has exercised my mind for many years and I would like to present my views on the matter. I believe that Henry is premature in his statement that the selection of the position upon which ancient sites were constructed was not dependent on the underground water or the energy present and that ancient people did not need to be aware of their presence through what we call dowsing or other intuitive methods. Those who dowsed the crop circles did what I believe to be a very essential thing, in that when dowsing for underground water, they differentiated between large deep flows and smaller shallow veins. I have observed many times small blind springs and shallow veins of underground water changing course due to circumstance. Many of these observations were far away from ‘sacred’ structures and where no intentional human activity took place of a meditative nature. To gather this evidence I have spent many hours dowsing around ordinary, everyday functional, mundane, objects and structures that have no sacred significance and where few people give them a thought. One of the early examples I found was on the Lancashire moors, miles from anywhere. I observed in the distance what looked like a standing stone with a blind spring beneath it. When I got close I found it was a pile of single stones, one on the top of the other, providing a marker on one of the few footpaths that crossed the moor. When I dowsed around it I found that, indeed, underneath was a small blind spring or water dome with several small flows running from it and descending down downshafts as Tony and others found at the crop circles. Further dowsing revealed that a small flow appeared to have been diverted in a loop from a larger flow a few paces away to pass beneath the cairn, form the blind spring, and flow on to rejoin the parent stream about twenty paces further on. See diagram below. Dowsing around other things like gate pillars, random boulders on hillsides, electric pylons show that a large percentage of them have small underground flows of water underneath and many have blind springs as well. There is similar evidence, as I described above, to show that this has been diverted from a larger flow nearby and is of recent origin. In parkland, near Moulton in Northamptonshire, the local council had constructed a labyrinth by placing gravel to form the pathway. I first observed this about two years ago, shortly after it was constructed, and there was a blind spring several yards away to one side. When I was there again, a year later, the blind spring was close to the centre of the labyrinth. I could continue to give many more examples where a structure and not human intent or activity had caused underground water to be diverted so that it is now underneath it. This does not deny or make erroneous the fact that human activity with intent can and does cause similar changes to occur. Now for the other side of the argument. 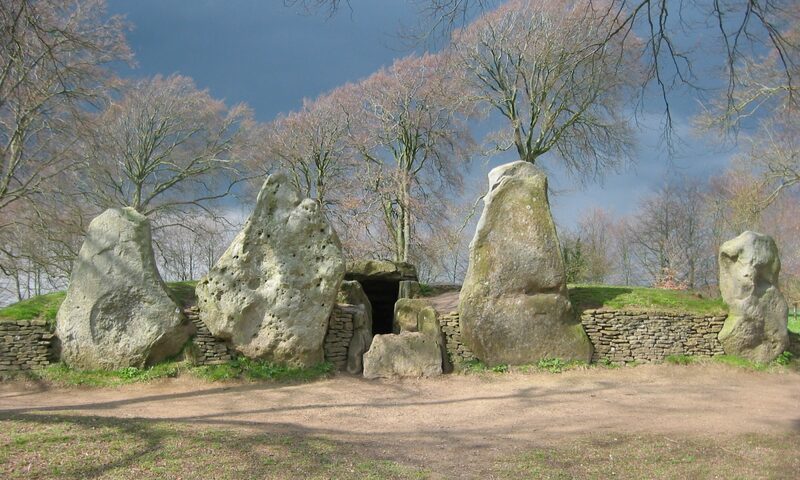 In my booklet “Megalithic Structures: Why?” I state that at ancient sites stones are erected over the intersection points of the edge lines or centre lines of major deep underground flows and that the position of these intersections dictates the placing and spacing of the stones. The major flows that I refer to are from 20 to several hundred paces wide and can be from 400 to several thousand feet deep. The building of a stone circle last June, as described in an article in the September 2000 newsletter by Tony Hathway, was to put the theory to the test that ancient stone circles were built precisely according to the blueprint laid down on the ground by the intersections of major flows of underground water. There was no attempt to lay out a circular form. They contained geometry very similar to that found by Alexander Thom when he surveyed many ancient sites throughout Britain. Also, at all of them there were true north/south alignments. At two of these circles I was able to observe the rising and setting of the sun at the time of the autumn equinox. Two of the posts, marking the intersection points, were exactly on this line as the sun rose and set against the nearest horizon. I have inspected several places where stone circles were recently constructed and the builders did not take into account the underground water present on the site. I found, at these, that under most of the stones small flows were present and that a blind spring or springs could also be dowsed within the area of the circle. The thing that was absent in most cases was the presence of major flows, and where some did exist, there was a lack of the relationship between the stones and the intersections of the edge lines. This would indicate that major flows of underground water are not influenced by these structures but minor flows are. Similarly so with human activity and intent as most of these circles were constructed and used for ceremony and such like things. The same applies to the energies present. All objects, and hence structures, have their own unique energy field with associated lines and patterns. However, underground anomalies and water filled fissures act the same as objects and display their own field of energy. Therefore, at these locations, where major flows cross, there was a unique energy field surrounding them before the structure was placed there. Each stone, again, had its unique energy field and the combined interaction of all this results in what we dowse at the completed structure. A third dimension comes into play, as stated by Henry, through the use that the location is put to after construction. A very good example of this can be seen in the article, in this issue, by Jan Spence, and an earlier report by Jan in the June 1999 issue which was of a full years dowsing of an energy line at Fishbourne Church. These clearly show that religious activity had a noticeable affect on the energy lines that were present at these locations. We also have other dimensions due to the cyclical affect of the earth, lunar and planetary movement. These are some of many factors contributing to what we find at ancient sites and no single one of them overrides or invalidates the other. Therefore, with regard to underground water and energies at ancient sites it is far from a black and white issue. We should consider the possibility that the egg and the chicken can and do exist together and for those who know a little about hens, black hens generally lay white eggs.